Do you love a Hungry Jack’s breakfast each and every morning but find the idea of actually speaking into the order taking machine all too taxing? Well, you no longer have to thanks to the burger chain’s new Brekk-E-Tag system. 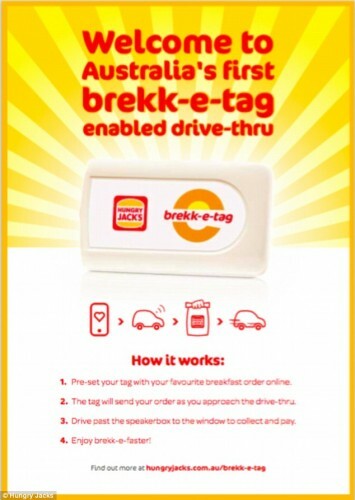 Simply fix Brekk-E-Tag to the windshield – as you would a road toll e-tag – it automatically remembers your order, drive through the drive-thru, and your sausage and egg muffin and coffee are waiting at the other end. However, the Brekk-E-Tag doesn’t eliminate totally and utter laziness completely as you’ll still have to pay at the other end and lean out the window to receive your order. Hungry Jack’s apparently came up with the idea when it realised its breakfast customers were habitual and would use its drive-thrus most mornings and order the same meals. But in bad news for lazy junk food lovers, the system is presently being trialled in just the one outlet – its Tumbi Umbi restaurant on the NSW central coast.